Illumination Entertainment is an animation studio that clearly has no aspirations to match Pixar or even DreamWorks Animation in terms of quality, and just does whatever it wants to do to please its younger audience, from making cutesy pet-based Toy Story knock-offs to anything involving the Minions (incidentally, they’ll be back in this summer’s Despicable Me 3, so prepare accordingly if you’re not a fan of the yellow creatures). They are also way too generous with their publicity campaigns, with trailers debuting many months in advance and apparently playing in front of every movie, putting up posters left and right all across cinemas everywhere, and in some bizarre cases – including their latest film, Sing – putting an actual advert for their film in one of their actual films, in this case on the side of a bus in last year’s The Secret Life of Pets. This begs the question of whether such extravagant publicity is worth it for films which turn out to be only “okay” at best, but their efforts always seem to pay off as their films has brought in a total of over $4 billion at the worldwide box office, with no signs of slowing down just yet, with Despicable Me 3, The Secret Life of Pets 2 and a new version of How The Grinch Stole Christmas next on their cards. 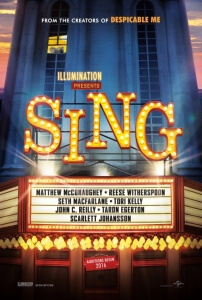 Expect the extravagance to continue with those films, but for now Sing is their latest film to receive the treatment, and just like most of Illumination’s other films, it has some qualities to it but never to the level of the rival animation giants out there, and is merely just a passable kid’s flick at its core. Set in a world of anthropomorphic animals, it centres on a big-dreaming koala named Buster Moon (Matthew McConaughey), the owner of a rundown theatre that’s running worryingly low on funds. To save it from foreclosure, Buster organises a singing competition for the whole town to participate in – which they do, but only under the pretence that they will be in for a chance to win $100,000 cash prize, due to a computer typo. Nonetheless, the contest attracts several musical personalities of all shapes, sizes and species, including an overworked pig housewife (Reese Witherspoon), a reluctant gorilla gang member (Taron Egerton), a brash porcupine punk rocker (Scarlett Johansson), an arrogant mouse crooner (Seth MacFarlane), and a shy elephant teenager (Tori Kelly) who is too frightened to even share her voice with the world. Think of it as The X Factor if it took place in the world of Zootropolis, only without quite as much thought or imagination as that film. The kind of film you’d be expecting from a premise like this, especially one geared more towards families with small children, is exactly the kind of film you’ll end up getting. If you’re going into this film expecting genuine surprises or a touching storyline, then you are very much in the wrong place, as this is more concerned with having its many cutesy animals do as many funny things or sing as many popular songs as the film can muster in its oddly overlong 110 minute running time. It’s odd, because the film’s writer and director is none other than Garth Jennings, who is best known for live-action films like Son of Rambow and the 2005 adaptation of The Hitchhiker’s Guide to the Galaxy, in both of which he knew more or less how to make something with a simple-ish premise stand out as something genuinely unique, whereas this falls right in line with dozens of other animated films you’ve seen many times before, right down to the fact that it has animals for its characters. This film is just an excuse to have an A-list cast sing pop culture songs and follow it up with a fart joke for no reason, or something that feels like it’s there only because they want to please younger viewers. It does not try to be anything else, and for that reason you can expect it to fade into obscurity quite fast. There are some positive things to say about it, like the animation is nice and colourful, and some of the song renditions are actually well sung (say what you want about Seth MacFarlane’s type of humour, but he is a damn great singer, especially with the classic Rat Pack numbers; can someone cast him as Frank Sinatra in a biopic already? ), but other than that there’s not much to really say about Sing, other than that it’s a fine two-hour distraction for your young kids that you’ll otherwise forget about quickly. Not much to sing about, really. Sing is another film in Illumination Entertainment’s line-up that is merely okay but will most likely be forgotten very shortly afterwards, because it doesn’t do anything that unique outside its cookie cutter plot and lenience towards pop culture songs that will date it fast. Your kids will dig it, but that’s about it.